Post2FB is a WordPress content export Plugin to Facebook. 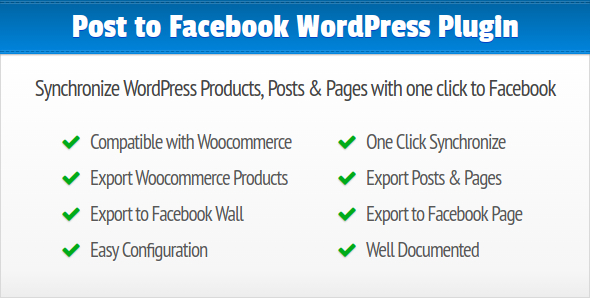 Synchronize your Woocommere products, WordPress Pages and Posts with your Facebook Wall and Page with just one click. No programming knowledge required. It is compatible with any active WordPress Theme. You can choose where to display the product, either on your Facebook Wall or on your Facebook Page, or both. The synchronization is very simple and quite fast, you have two buttons to publish the products on Facebook. Save time with search engine optimization and spread your products directly among people of your target group. Take advantage of the wide range of social networks like facebook and market your products with little effort. The installation and configuration of the Post2FB WordPress plugin is very simple and usually takes no more than 1 till to 2 minutes. A step by step guide tells you all necessary configuration settings so you can get started right away. If you can install WordPress, the installation and configuration of the Post2FB plugin is a child’s play for you.